The Freedom From Religion Foundation is decrying Vice President Mike Pence’s use of the killings at the synagogue in Pittsburgh to further his Christian nationalist agenda. 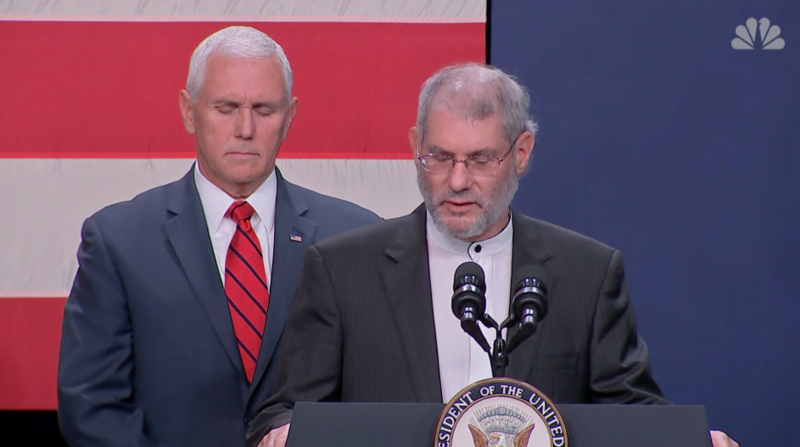 At a political rally on Monday, Oct. 29, Pence hosted a religious figure who prayed to Jesus for the Jewish victims of this weekend’s mass shooting in Pittsburgh. Although prayer-giver Loren Jacobs identifies as a “rabbi,” he represents Messianic Judaism, which believes in the divinity of Jesus. In the eyes of major Jewish denominations, Messianic Jews are Christians with a specific goal to convert Jews to Christianity. FFRF has called out Pence for his anti-constitutional Christian nationalism in the past. Pence proudly bills himself as “a Christian, a conservative and a Republican in that order.” As Indiana governor, the “Christian first” politician signed a bill into law to legalize religion-based discrimination against gays and others, including atheists. He also signed one of the most draconian restrictions of abortion in the nation. Pence’s opportunism — his taking advantage of the worst anti-Semitic mass murder in U.S. history in order to promote Christianity — is despicable. FFRF hopes that all Americans will recognize this as yet another example of the damage that results when religion and government are mixed together. The Freedom From Religion Foundation is a national nonprofit organization with more than 32,000 members in every state across the country. FFRF’s purposes are to protect the constitutional principle of separation between church and state, and to educate the public on matters relating to nontheism.